Used widely at investment banks and universities, the Accounting Crash Course will bring trainees up to speed on the income statement, the balance sheet, the cash flow statement and more. 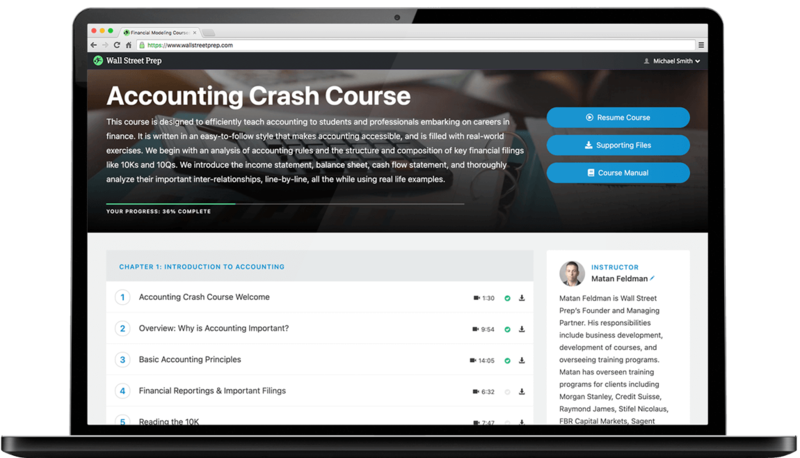 Our step-by-step video lessons make accounting accessible and are filled with real-world exercises that test and reinforce covered concepts. We begin with an analysis of basic accounting rules and the structure and composition of key financial filings like 10Ks and 10Qs. Then, we introduce the income statement, balance sheet, cash flow statement, and thoroughly analyze their important inter-relationships, line-by-line, all the while using real life examples to reinforce important concepts. The course concludes with a discussion of ratio analysis that ties together previously covered concepts. This course satisfies the accounting prerequisite for every Wall Street Prep financial modeling course. Step-by-step video lessons make accounting accessible, and are filled with real-world exercises that test and reinforce covered concepts. 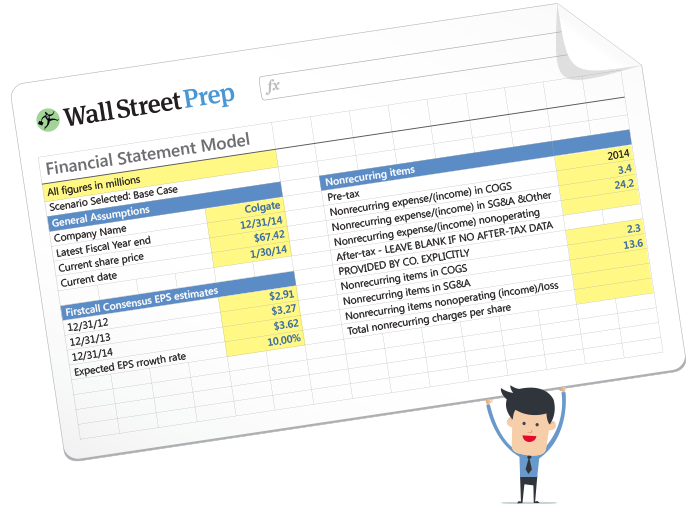 Wall Street Prep's Accounting Crash Course is used at top financial institutions and business schools. This course was exceptional. Easy to understand and follow. I now have more confidence in my ability to speak and understand finance. Course was FANTASTIC. Content was clearly explained. Very, very effective style of teaching. I could say that the course saves a lot of time for someone who is deciding between this online course and a classroom-taught course. My main goal when buying the courses was to learn the technical skills needed to compete against students from target schools. Wall Street Prep is more concise and comprehensive compared to other similar products I've tried. I have completed the Accounting Crash Course and the Analyzing Financial Reports courses, and both courses were effective and time well spent. These programs so far have helped me understand the accounting foundation needed to answer technical questions in interviews. After completing these courses, I'm looking forward to purchasing the industry-specific modeling courses. My background is engineering and project management. I took on a new role in Corporate Development focused on M&A Project Management and I needed to get up to speed on Accounting and "finance talk." This course was what I was looking for to get up to speed. It's allowed me to better follow discussions and engage in discussions with finance folks. The course was a requirement for a Managerial Accounting course I'll be starting in September. I found it fascinating and enlightening! After completing the course I wouldn't have even considered other providers because of the very clear way the material was presented. Upon completion of the course, I felt confidant in my ability to understand the financial statements, the ways they interconnect, and also what to think about if I were to set up my own business. Most accounting textbooks and courses are not as clear as this course. I now feel ready for the MBA-level Managerial Accounting course that I will start next week, and I do also feel that I understand more about business now (in terms of the financials) which will also help me in my job as a business professional / product manager. The Accounting course hit all of the major topics, going in depth just the right amount. I also enjoyed the use of occasional questions during each video as an "understanding check." The excel problems were also a nice way to tie in learning concepts with practical applications. This course will always be a point of reference whenever I am working through difficult financial accounting problems. I am an engineering student nearing the end of my graduation. As such, my goal in enrolling Accounting Crash Course was to advance my knowledge of accounting to potentially qualify for a career in business. The crash course was satisfactory and comprehensive. The lessons were clear and I learned many concepts about accounting which I previously did not grasp very well. I now have a better understanding of a key concepts, and thus feel more prepared for job interviews. I'm a VP at a Healthcare Investment company and a part time CBO at a medical diagnostics company. I took the Accounting Crash Course for continuing ed and to prepare for your financial modeling boot camp I'm attending soon. My firm recommended WSP to me. Overall this course was a good review. I liked the way the lessons are broken down into small chunks. Frankly, I’d be screwed without having taken the crash course. I was wrapping up my sophomore year at the University of Illinois and was/am beginning the IB summer analyst (2019) recruiting process. Once I observed some materials for technical review, I realized that my econ curriculum (econ major) had literally zero accounting involved. I took the crash course to gain any and all of my accounting knowledge and it certainly served its purpose for helping me become acquainted with the three statements / line-items / intertwining. While I have only had one interview (JP Morgan) and totally blew it, I feel much better prepared moving forward as a result of having completed the Acct crash course. If there are any non-accounting majors considering trying to land an IB internship without having taken an accounting course through their university, WSP is an absolute must. I have a Chemical Engineering undergrad degree and my main goal was to understand the financial impact that inventory movements have in the Financial Statements. A very trustful friend recommended me this program. I really enjoyed the course. It helped me understand the impact that obsolete items in inventories may have, also that this movements are not cash exits but do have movements in the balance sheet, as well as how to read inventories in the financial statements, and so on. I was able to structure a plan to avoid obsoletes, and help with the managing of costly obsoletes exits. I'm sort of an atypical financial executive in that my training is in medicine, and I achieved a leadership role in my shop via a different route than the normal B-school to analyst to director pathway. I'm something of a self-starter, but I felt that I needed a more complete understanding of business accounting, so this was perfect for me. My main goal was to speak the accounting language at the very least, and at best be more proficient in assisting my accounting team in compiling our books and assessing those of our investment partners. I loved this course. It was so perfect for what I needed. I've already passed you off to the executive development team at my organization to use for their curriculum building. It certainly helped me shore up my understanding in this blind spot of my knowledge, and made me a more effective decision maker and probably a less dangerous employee! My main goal when purchasing the Accounting Crash Course was to review accounting basics prior to start with the financial modeling courses. Right now I'm working while finishing my masters in corporate finance. I started doing research about which online course was better for studying financial modeling, and I decided to go for WSP because it is the page that most Investment Banking firms use for their analyst to learn financial modeling. I think the course is really good, and with the exercises it really hep you internalize what you have learned. For sure I will keep with WSP for a Real State financial modeling course I want to do. My main goal when taking the accounting crash course was to get up to speed on reading and understanding corporate financial reports for my MBA program. I enjoyed the course, it was extremely helpful and felt it explained financials clearly and in the right amount of depth. The course has absolutely helped to advanced my professional goals, it was an excellent. The main reason I chose Wall Street Prep was because of the brand recognition which is highly regarded in the investment banking community. The course was also very cost effective, yet comprehensive and allowed me to study in a flexible format. I found the Accounting Crash to to be fantastic and a great way to prepare for a career in finance/investment banking! This course was recommended to me as preparatory material for my MBA program. It gave me an overview of the fundamental accounting statements, which I continue to refer to and work through. It has helped me with understanding the concepts of accounting, which will be very beneficial in the long term. I chose WSP based on a combination of price and user reviews. I thought the course was really well designed and allowed me to 'front load' basic accounting concepts which is exactly what I was looking for. I am currently a financial adviser looking to jump into a research/analyst role. I took 3 accounting courses in college but wanted a quick, in depth refresher for interview preparation. All the material was well structured and easy to navigate. This course well exceeded my expectations and the WSP team did an excellent job. Worth way more than what I paid.